Although Iowa is a landlocked Midwestern state, the Mississippi River flows along its entire eastern border, the Missouri River and the Big Sioux River flow along its entire western border, the Des Moines River runs along the southern border from Farmington to Keokuk, and over four dozen rivers flow through the state. The Iowa Great Lakes consist of several natural lakes within glacial potholes, and man-made lakes include Lake Odessa, Rathbun Lake, Lake Red Rock, and Saylorville Lake. All told, a little over 401 square miles of Iowa are covered by water. What is Iowa's maritime history? The state's waterways have been important sources for transportation, trade and food from prehistoric days, as evidenced by the remains of many Indian villages found along the banks and on bluffs near the state's rivers. Later, barges, flatboats, keelboats and steamboats transported people and supplies to frontier settlements, mining towns, trading and military posts, and carried raw materials and agricultural goods to market. Cross-river flatboats ferried local traffic from one side of the river to the other. Many of the state's important towns developed along the banks of the rivers including Dubuque, home of the Dubuque Boat and Boiler Works that was the largest shipyard in the upper Mississippi River valley. Thousands of steamboats traveled up and down the Mississippi, the Missouri, and even a few interior rivers until the railroad came, and hundreds of steamboats were lost along the way. One unfortunate steamboat was the Bertrand that struck a snag and sank at De Soto Bend along the Missouri River in 1865. The Bertrand was headed to the Montana Territory when it went down with its cargo of supplies for the gold fields. 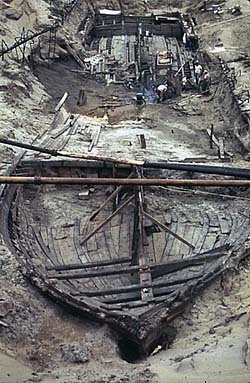 In the 1960s, the wreck was discovered on the De Soto National Wildlife Refuge. It was excavated and the collection of well preserved artifacts, including foodstuffs, household goods, mining equipment, and tools, is exhibited and stored at the Bertrand Museum north of Council Bluff. Who takes care of Iowa's underwater archeological sites? The responsibility for the discovery, location, excavation, recovery, restoration, and preservation of archeological sites falls to the State Archaeologist, who is a faculty member in the University of Iowa's Department of Anthropology. The State Archaeologist coordinates activities with the Iowa Department of Cultural Affairs, the Department of Transportation, the Department of Natural Resources, and other state agencies concerned with archeological sites, and publishes educational and scientific reports on Iowa archeology. In 1999, the State Historical Society of Iowa issued "Guidelines for Underwater Archaeological Investigations in Iowa" as part of a larger set of Guidelines for Archaeological Investigations in Iowa. The State Archaeologist conducts many collaborative projects with researchers and organizations including those not affiliated with the University of Iowa. Opportunities also exist for college and high school students, and for volunteers. The State Archaeologist should be contacted for further information. What laws concern underwater archeology in Iowa? Several sections of the Iowa Code relate to archeology including � 263B (State Archaeologist), � 303 (Department of Cultural Affairs), and � 465C (State Preserves). Relevant regulations in the Iowa Administrative Code include � 221 (Department of Cultural Affairs), � 223 (State Historical Society), � 575 (State Preserves), and � 685 (State Archaeologist). All are accessible on the state's legislative search engine.